The following page details the products required to install a 'Solid circular' lightning protection system. Additionally, accessories are also available. Manufactured from high conductivity hard drawn copper or aluminium, with rolled threads. Supplied complete with locknut. "Field Trials in the United States, carried out over many years research have confirmed that blunt air rods are struck by lightning in preference to taper pointed air rods." Part numbers in this range include RA400-FU, RA402, RA080 and RA085. Manufactured from high quality copper and aluminium alloys. Simple to install, providing an effective connection between an air rod and the solid circular air termination conductor in either the horizontal or vertical plane. Part numbers in this range include SD307, SD305, SD007 and SD005. Manufactured from high quality copper and aluminium alloys. Designed to provide an exposed attractive point on conductor systems hidden/embedded in the building's fabric e.g. below the concrete slabs or ballast of a flat roof. Part numbers in this range include PL010, PL005 and SM010. Manufactured from pure copper or aluminium, these simple pressed clips are available to suit bare and PVC covered copper and aluminium solid circular conductor. Part numbers in this range include CP905, CP925, CP915 and CP935. Manufactured from high quality copper and aluminium alloys for excellent corrosion resistance and high pull off loads. Manufactured from high grade Polypropylene, UV stabilised against degradation by sunlight and non-brittle to prevent cold weather damage. Available in five colours to match bare and PVC covered copper and aluminium solid circular conductors. Part numbers in this range include CP872, CP887, CP861, CP871, CP876, CP881 and CP886. Designed as a means of securing conductors to surfaces that cannot be penetrated by a screw. Ideal for aluminium, spangled galvanized steel, colour coated steel, glass, perspex, enamel and stainless steel. Manufactured from high grade plastic, UV stabilised against degradation by sunlight and non-brittle to prevent cold weather damage. Use on surfaces other than PVC roofing. Part numbers in this range include CA872, CA887, CA861, CA871, CA876, CA881 and CA886. Provides a secure means of fixing flat tape conductors to single ply polypropylene, polyethylene and PVC roof membranes using an industrial heat gun, where solvent welding is not applicable. Manufactured from high grade PVC, UV stabilized against degradation by sunlight and non-brittle to prevent cold weather damage. Part numbers in this range include HW015-FU, HW020-FU, HW025-FU, HW030-FU, HW040-FU, HW045-FU and HW050-FU. Provides a secure means of fixing circular conductors to single ply polypropylene, polyethylene and PVC roof membranes using an industrial heat gun, where solvent welding is not applicable. Part numbers in this range include HW887, HW872, HW886 and HW871. Highly versatile, innovative standing seam roof fixing including non-metallic DC tape clip, suitable for use on multi-profiled seam roofing structures up to 22 mm thickness. Use with bare and PVC covered copper and aluminium conductors. Separate datasheet available on request. Part numbers in this range include SC015, SC020, SC025, SC030, SC035, SC040, SC045 and SC050. Highly versatile, innovative standing seam roof fixing including square tape clamp, suitable for use on multi-profiled seam roofing structures up to 22 mm thickness. Use with bare and PVC covered copper and aluminium conductors. Separate datasheet available on request. Part numbers in this range include SC105-H and SC005-H. Provides a secure means of fixing conductors to single ply PVC roof membranes. Manufactured from high grade PVC, UV stabilised against degradation by sunlight and non-brittle to prevent cold weather damage. Clips are available for Polypropylene, Polyethylene and other roof membranes. Part numbers in this range include CW872, CW887, CW871 and CW886. Solvent and surface primer cannot be supplied outside the UK. Part numbers in this range include CW905, CW999 and CA900. DC tape clips manufactured from high quality copper and aluminium alloys for excellent corrosion resistance and high pull off loads. Part numbers in this range include GD872, GD887, GD861, GD871, GD876, GD881 and GD886. Designed to allow circular conductors to be fixed to tiled roofs without compromising the waterproofing nature of the roof. The 500mm tail fits neatly between overlapping tiles and is wrapped around/fixed to the tile lathe for secure fitting. Part numbers in this range include HF176 and HF191. 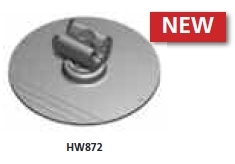 Designed to secure bare, 8mm diameter, circular conductors to flat roofs. Supplied filled with concrete the conductor is held in place by the weight of the holdfast. The lip around the base of the product permits the holdfast to be built into bitumen type roofs. Part numbers in this range include HF975. Designed to provide low resistance cross joints in solid circular conductor networks. Manufactured from high quality copper and aluminium alloys for excellent corrosion resistance. Part numbers in this range include CS605 and CS610. Designed to provide low resistance tee joints in solid circular conductor networks. Manufactured from high quality copper and aluminium alloys for excellent corrosion resistance. Part numbers in this range include CS505 and CS510. Designed to provide low resistance parallel joints in solid circular conductor networks. Manufactured from high quality copper and aluminium alloys for excellent corrosion resistance. Part numbers in this range include CS405 and CS410. Designed to provide low resistance tee joints in solid circular conductor networks. These multi-purpose clamps can produce circular to circular or circular to tape connection in both through and tee configurations. Manufactured from high quality copper and aluminium alloys for excellent corrosion resistance. Part numbers in this range include CN305 and CN310. Manufactured from a friction welded joint between high conductivity copper and aluminium to provide the ideal means of interconnecting copper and aluminium conductors whilst avoiding bimetallic corrosion. Part numbers in this range include CN915 and CN920. For all the items in this range we recommend the use of oxide inhibitor when aluminium fittings are installed. Oxide inhibitor is a non-water soluble, natural-petroleum based polymer grease that seals electrical connections from oxygen and moisture. Part numbers in this range include CM005.